Will Okja be this summer's big phenomenon that everyone is waiting for? Quite possibly we're looking at the next Stranger Things, which took last summer by storm. If Netflix's dominance in the streaming, home media entertainment market wasn't enough, they are now going after long held studio concepts. By this, I mean they are trying to make event television with their original feature films. Actually, they are trying to make 'tentpole TV'. You know, those shows and movies that are more than just the sum of their parts. There can be sequels. There can be spin-offs. These Netflix Original Movies can be just about anything you can think of. And they are talked about all summer long. That certainly rings true of Okja, Netflix's first attempt at a Hollywood summer blockbuster. And they've succeeded! Believe it or not, there was a time when movies in theaters didn't come to us from comic books. There was a time when big movies weren't sequels to previous blockbusters. There was a time that a movie could open, not be the most anticipated film, yet (gasp!) it would not die on the movie distribution vine. In fact, like the bigger movies playing in theater, this film could play all summer and beyond. We would continue talking about, dissecting it and we would see it more than once. Nowadays, the biggest movie will be number one for two weeks and then be forgotten before it starts its third. And that's after breaking all kinds of pumped up records at the box office. Last Summer, Netflix wowed us with Stranger Things. This piece of throwback, 1980s nostalgia, was a mid-summer offering that took the internet and the world of TV (and movies) by storm. Viewers tried to figure out the meaning behind this oddball, 80s mashup. They tried to look for clues to make sense of its ambiguous ending. The conspiracy theorists saw this show as a metaphor for all the ills that our government is slyly laying upon us. In short, it was everything to all people and Stranger Things was a bonafide phenomenon. It was the talk of the summer and continues to generate excitement as its second season looms. So this summer, Netflix gives us the (somewhat) equally high minded Okja. This story follows Mija. She is a young woman who is trying to protect a very lovable animal called Okja. 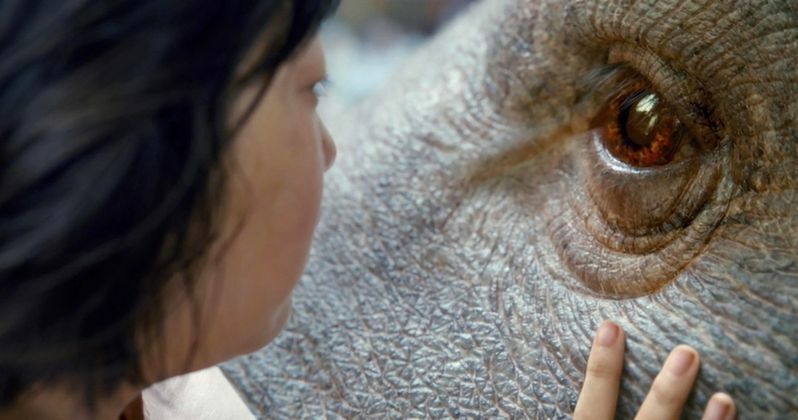 A large company wants to take Okja, mass produce this animal, and turn it into food and whatever else humanity can use from its innards. This Netflix Original film is billed as an action, adventure, drama. Based on the trailer there's a larger political message. This message is so overpowering it almost seems like Okja is a dark comedy. Making this more amazing is that Okja is being marketed as a kids' movie. It literally is this summer's E.T., The Goonies and Gremlins all rolled into one. The big question is, can this offbeat tale (which features an odd yet adorable new animal, a very different looking Tilda Swinton, and an almost unrecognizable Jake Gyllenhaal) be this summer's Stranger Things? Can it resonate with audiences in the same way and a have a life far beyond our HD TVs? Will we see Super Pig Monsters at Comic Con and other fan fests? Honestly, for as weird as Okja looks, it upholds the classic elements of 80s cinema while being its own thing. It also carries that cool factor Stranger Things held so dearly. Sure, Okja is bizarre. At the same time, Okja is a bold film. It is actually, in many ways, a 21st Century E.T.. It's just a lot, lot darker. Stranger Things played on nostalgia to drive it's story. As good as it was, it followed the A, B, C's of 80s movies quite routinely. Okja turns that notion to its advantage, and becomes this wholly original beast. You've never seen a creature like this on the screen before, nor this type of story wrapped around it. This is another way Netflix is bringing back the old time, moviegoing experience, yet, they are doing it in our homes and not at the multiplex. Ironic that that this forward thinking company is actually using an old business model...And succeeding. Stranger Things was only really odd if you were new to that genre of filmmaking. For the people, like myself, that came of age in the 1980s, this show was awesome because of how well it seemed like it could have been from that time. Okja is tamping on similar ground. The plot is interesting, spreading a solid message about the sanctity of life and the vagaries of greed. It is a film filled with imaginative ideas. It is also a film filled with grand adventure and enthralling action. It's the kind of spirit that Stranger Things reveled in. Though, Okja doesn't quite have time to build in the same way as Stranger Things. Stranger Things was basically an 8 hour 80s movie. Okja is just about 2 hours in length. No matter how much Okja could cram into it's nearly 2 hour time frame, it doesn't have the canvas that Stranger Things did. In fact, as most of you know, that canvas is expanding as the second season of Stranger Things will have 9 episodes instead of 8. Okja doesn't have the room to explore the ideas that Stranger Things takes on, sure. Also, because it only has two hours, by design Okja can't be filled with as many ideas as it would like to be. What we have here is an issue between dueling mediums. And in this race, TV is going to win this marathon every time. But on that note, it takes less time to devote to Okja, and it truly upholds the notion that Stranger Things tried to kick forth. In essence, it's the type of movie that Stranger Things would have stolen from had it been released in the 80s instead of 2017. Which is what makes Okja so impressive. It doesn't really need to expand beyond its self-contained story. This is a Netflix Original film. Even though it is like other movies from back in the day, it is very much of this day and time. This brings us to the question of fairness? Is it even right to compare Okja to Stranger Things? Are we setting Okja up for failure by even doing so? Well, the reality of this situation is that if Stranger Things did not exist, we probably wouldn't be scrutinizing Netflix's summer offerings how we are. However, the genie is out of the bottle. Netflix has been such a powerful entertainment juggernaut, that we have come to expect greatness from it. It's very similar to how we expect similarly solid programming from HBO and AMC (after the mega-success of Breaking Bad). And Netflix has made fans and viewers quite happy in this regard. And all of this goes back to the freedoms that writers, producers and directors are afforded by companies like Netflix. Talent loves Netflix because they can literally do anything they want. It sort of reminds one of how studios dealt with the changing Hollywood system in the 1970s. The studios back then didn't know what to do. They were desperate. They didn't know what audiences wanted. Then suddenly independent films started to appear. Studios had to start taking chances because people wanted something new and fresh. As a result we got Easy Rider, Dog Day Afternoon, Mean Streets, A Clockwork Orange and a host of other unforgettable films that continue to be talked about years after their release. People also remember that studios who released them, too. There was no Netflix or Amazon Studios in 1975. In 2017, the only studios with any real guts, with any real desire to release movies (not TV) that aren't from the same cookie cutter mold we have all seen before are places like Netflix and Amazon Studios, and smaller low budget production houses like Blumhouse and A24. They are creative dens where iconoclastic directors like Bong Joon Ho can make films like Okja. Directors of this ilk can make the movies they want without the studio interference of the homogenous "development process." It's why so many directors are flocking to these alternative places to make their films. The reality is that the big studios are slowly becoming what they were in the 1970s. Clueless places of content that were ultimately usurped by the creative types they would have to give free reign. And because of this, we're getting one of this summer's coolest, best blockbuster movies on a streaming service. But perhaps there, it will have more time to be discovered and become the true summer phenomenon it deserves to be. Of course, Netflix could always become an unwieldy behemoth. And if that happens the power will shift again as it shifted back to the studios in the 1980s. Ultimately, this led to the Blockbuster/McMovie mentality that has ebbed and flowed throughout various decades. Netflix is a shrewd company. They have an unholy amount of content. They've afforded many creative types a wide birth. Something tells me that in addition to Okja, the show that is really going to be this summer's Stranger Things may not even on our radar yet. Or, is it? Is Okaj the brilliant film that will save and uplift the summer? Only time will tell but the deck seems strongly stacked in its favor. Okja is a one of a kind in a sea of faceless blockbusters. We have a feeling people will be talking about it well into September.